Chiang Mai Fencing Club members won four medals at the Royal Thai Navy International Fencing Tournament recently. Three Chiang Mai Fencing Club members brought home four medals from the Royal Thai Navy International Fencing Tournament. This was the 14th year of the three-day competition and there were over 420 fencers from 15 different countries. The Chiang Mai Fencing Club is the smallest club in Thailand, but the only club to take four medals in this tournament. The competition was fierce this year, with two current Olympic Gold Medal winners among the entrants. 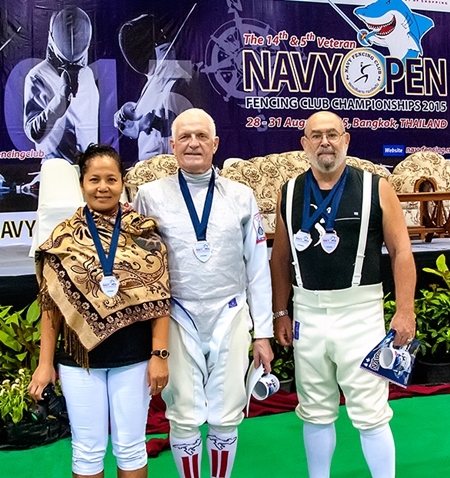 Wes Cannon (Mae Jo) won the Silver Medal for Mixed Foil 50+, Pennapa Cannon (Mae Jo) won the Bronze Medal for Mixed Foil 40+, and Steve Kramer (Chiang Mai) took two Bronze Medals, one in Foil 40+ event and one in Foil 50+ event. At age 69, Kramer was the oldest fencer, more than 50 years older than some of the competitors at the tournament. Fencing is ageless! For more information check the Chiang Mai Fencing Club Facebook page. The Club every Saturday from 1pm-4:30pm and Wednesday evening between 5pm-7pm. Our club is located in the 'Chiangmai Chinatown' building on the Frontage Road of the Superhighway, just a 100m east of Wat Ched Yot.